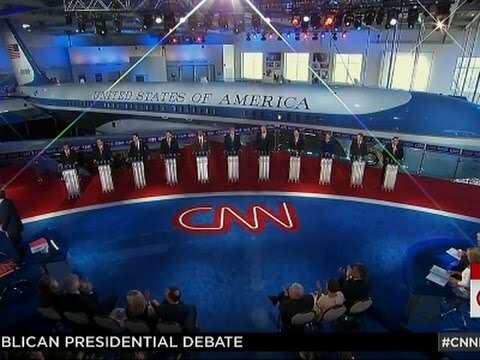 In the course of the second GOP debate at CNN, anchor Jake Tapper asked the candidates about Syria policy. “TAPPER: Thank you, Dr. Carson. Let’s move to Russia if we could. Shorter Trump: I will be such great friends with Vladimir Putin, it will make your head spin. Your whole life you could never dream of being as good friends with him as I will be. He’ll respect me because unlike Obama I’m not a namby-pamby wimp. I’m strong. I’m supercalifragilistic expialadocious. It would make your head spin to know how strong I am. So since he’ll respect me and I’ll be strong, I’ll just ask him to cut it out. If he doesn’t, I’ll call his face ugly. Nobody wants to be called ugly by me in public. You’d never believe what lengths people will go to, to avoid that. Some people have even had face transplants just so I don’t insult their noses or cheekbones. And America will be friends with Russia and Syria and ISIL because I’ll be strong and I’ll be friends with all of them and I’ll just call a time-out. China and Mexico, too. I’ll just give them all a time-out. I know about time- outs. It would make your head spin how many time-outs I got in school. And I’ll threaten all their presidents with a face transplant, even a comb over. Have you seen how bad a comb-over can look? Nobody wants that. Tapper: Why would President Rubio’s approach be more effective than President Trump’s? Shorter Rubio: Putin is like that guy with the tats who tries to steal your girlfriend in a bar. He’s going to make doe eyes and take Saudi Arabia and Egypt away from us. Then they’ll be in his bed and not in ours. And we’ll just be like the loser drinking mojitos at the bar all by himself. Not that I know what that’s like. Shorter Fiorina I have met Putin. By the time we split, he was almost bankrupt. I have that effect everywhere I go. I wouldn’t talk to him, he might want his money back. How would I deal with Syria? I’d rebuild the Sixth Fleet. I know Syria is mostly desert. But I’m sure you could get a destroyer in there. And I’d send thousands of troops to Germany. Why, Germany is almost next door to Syria. GIs in Munich. That’ll fix Syria’s wagon. And I’d just give Egypt and Jordan everything they could possibly want. It would make your head spin how much I would give Egypt and Jordan. I know Egypt hasn’t done a thing about ISIL in Syria. Maybe even President al-Sisi is leaning toward our sworn enemy Bashar al-Assad. But the main thing is to give Egypt everything it is asking for. Because of the sixth fleet, and Munich and also who wants to drink mojitos alone at the bar? Shorter Ted Cruz Iran is the hugest threat to the United States in history. It would make your head spin to know how huge a threat it is. True, its military budget is between Norway’s and Singapore’s. True, it doesn’t actually have a nuclear weapons program. But just by being Iran it is the hugest threat in the universe. You know that meteor that killed off the dinosaurs? That was a minor threat compared to Iran. Because Obama is the world’s leading financer of terrorism. Yes, I am a sitting senator and I am calling the president of the United States and the commander-in-chief of the American armed forces not just a terrorist but the biggest financer of terrorism in the world. Because Obama is going to let Iran actually have an economy, and they’ll be able to buy and sell things and there are 75 million of them and they are all terrorists, even the babies, because Obama is worse than that meteor that killed the dinosaurs. And I was solicitor general of Texas and I never let those black helicopters of the United Nations mess with Texas even once. And we never once had a meteor strike in Texas all that time because the United Nations is behind the meteors, you know. Shorter Kasich If Iran helps Hamas and Hizbullah we’ll put the sanctions back on, even though that isn’t part of the deal about their nuclear enrichment and isn’t written down anywhere and none of our allies will go along with it, because one of our problems is that we’ve alienated our allies and we should try to work with Europe and go to war with Iran down the road even though Europe would never, ever go along with that– all because we need to be close to our allies. TAPPER: …Thank you, Governor. I want to go to Senator Paul.